Description of "ACNEfied- the war against acne begins here (eBook)"
The book “Acne-fied- the war against acne begins here” provides a complete solution to deal with acne at home with the acumen of a dermatologist including skincare tips, diet and lifestyle suggestion, skincare regime for different types of acne, home remedies, product recommendations and acne scar prevention tricks. The author has cured many patients of acne using the solutions listed in the book, particularly the DIY listed in this book have shown excellent results. Dr Surbhi, MD Dermatology is founder and CEO of www.dermatocare.com It is first online portal in India that provides free customised advice for skin and hair concerns by a dermatologist. This is only website that provides researched and green skincare solutions, and the credit goes to reserach and dedication to this cause. 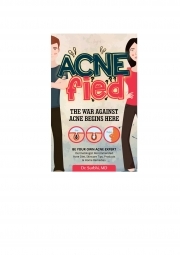 Reviews of "ACNEfied- the war against acne begins here (eBook)"